Recently while visiting one of our favorite sandwich shops, I noticed something a little different about the environment. My experience felt a bit more well-rounded. As I did a 360 around the shop I began to realize that there were lotz of things that were a bit different. The new furniture, new signage and a common theme on all packaging made it clear that this would not be a typical square meal. 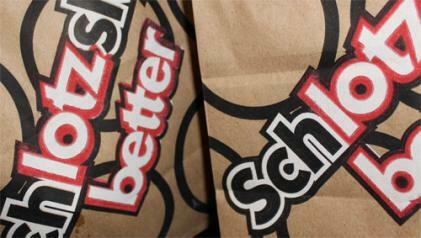 If the catchy title and terrible puns in the opening paragraph haven’t given it away, we are talking about the new branding effort put forth by Schlotsky’s. The new brand, or re-brand plays off of the circular shapes of the bread (or buns) that have made the Austin-based restaurant chain so successful. The ‘Lotz Better’ campaign is meant to present the visitors with a fresh, bright and contemporary feel. The integration of the character attributes to each of their chip and hot sauce (that sweet-sweet hot sauce) packages adds personality at every customer touch-point. The simplicity of the character attributes are what are the strengths of each element of packaging. The franchise is blatant about the consistency of the circle that adorns the new decor and products. 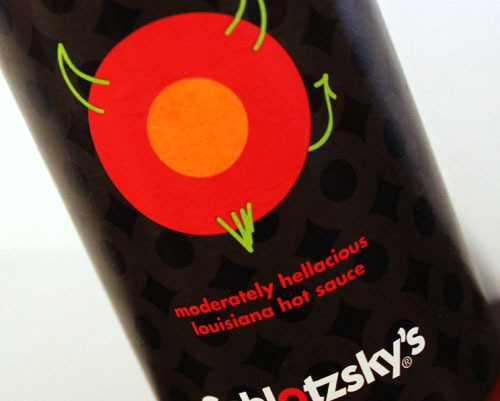 By adding horns and a devilish goatee to the circle on their hot sauce bottle, to onion sprouts on the circle on the sour cream and onion chips, to a bold black jagged line through the circle on the cracked black pepper chips, and the line art of a charcoal grill on the BBQ chips, it brings more interest and entertainment to the dining experience. 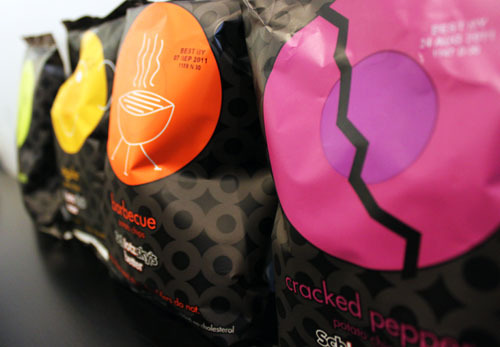 The personality of the product is completed with the catchy saying ‘bags need chips, not shoulders. A true testament to the rebrand was when I witnessed a group of patrons interacting with the new packaging. They were holding the chip bags and hot sauce bottle while turning them around, viewing all that the new look had to offer. This is gold in the branding world. The longer that someone interacts with the brand and/or the more impressions you can garner generally equals better returns. Admittedly, I do not think that they were checking out the caloric values, so something must have caught their eye. And as promised, ‘Every Bite’ was ‘Lotz Better’…especially with the hot sauce.